Governor Andrew Cuomo is ensuring that almost all criminally negligent deaths of the disabled are kept from county medical examiners and coriners, as well as from local police and county elected District Attorney’s. The criminal cover-ups are massive in scope. ALBANY, NEW YORK, UNITED STATES, September 12, 2018 /EINPresswire.com/ — The Jonathan Carey Foundation was established after 13 year old Jonathan Carey was killed by his caregivers in 2007. Jonathan was developmentally disabled; he had autism and was primarily non verbal. Jonathan was suffocated to death. Jonathan would be 25 years old today if he was not killed by his caregivers and by a system that was never fixed. The horrors and atrocities exposed at the Willowbrook State Institution were uncovered 46 years ago, yet New York State has still not genuinely reformed its mental health care system. Hardly any safety and abuse prevention measures are in place to date to ensure and provide safe care and services. Governor Andrew Cuomo has had every imaginable opportunity to make major reforms to protect our most vulnerable from premature death, but has chosen to cover-up the deaths instead. What a travesty this is and the loss of human lives are astronomical in scope. Between 11 and 13 people die on average every day within Gov. Cuomo’s mental health care system and he has ensured that most of these deaths are kept from local authorities so they can be easily covered-up. Over 20,000 deaths within the last 5 years and only two prosecutions reveals what is really going on. What kind of person covers up deaths of people with disabilities and leaves these dangerous people in a system to be able to possibly cause other deaths? It reminds me in many ways of Hitler’s actions, maybe not as blatant, but nevertheless similar in some ways, the systematically killing off of people that society may think are not equal or worthy of protecting. Jonathan’s death and the formation of the Jonathan Carey Foundation are really about critical changes and treating our most vulnerable among us as equal citizen and valuable members of society. No one else here on planet earth has loved me more than Jonathan and he is tremendously missed. Jonathan and his life’s story is a witness and demonstration of God’s love. Happy Birthday son, enjoy heaven and know that your dad is fighting for your friends safety, their protection and for their equal rights. Know that your dad will help to finally end one of the most egregious discrimination in civil rights imaginable, the bypassing of 911 call systems for people with disabilities. Know that your dad will help fulfill your destiny and help bring about great changes from the horrors you suffered. The dream that God gave me a few months before Jonathan was killed speaks volumes. Jonathan was sitting in a testimony box in a court room with an old fashioned cone shaped megaphone held up to his mouth. Written on the side of the megaphone was the word – RIGHTEOUSNESS. When I awoke, I told my wife Lisa that God was going to use Jonathan to testify and speak loud and clear for RIGHTEOUSNESS! Jonathan through everything that happened to him and through the Jonathan Carey Foundation named in his honor speak for what is right and just so that critical changes can finally come forth. The cover-ups of deaths must be stopped. Many safety and abuse prevention measures must finally be put in place to protect people with disabilities. Our most vulnerable need and deserve equal access to 911 emergency medical and police services. The wide-scale discrimination, civil rights and human rights violations against people with disabilities must cease. All people that take the lives of a person with a disability because of their actions or in-actions must be prosecuted. Everyone, including Governor Andrew Cuomo, that are involved in the criminal cover-ups of these horrific deaths must be held fully accountable by law, these atrocities and death cover-ups must be stopped now. 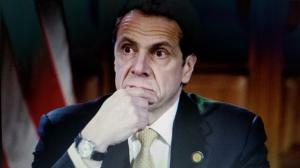 Federal authorities have been asked to intervene because of the extreme corruption within the Cuomo administration.